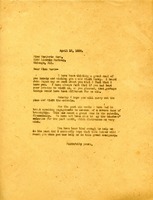 Letter to Martha Berry from Valentine E. Macy, Jr. 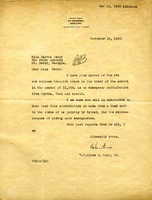 This letter is written to Martha Berry from Valentine E. Macy, Jr. about an emergency donation that is being sent to the Berry Schools. The need for the emergency donation is not mentioned, but Macy states that the account that was made for the purpose of emergency donations. 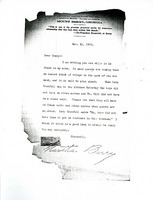 Martha Berry writes to tell Grady that they need to plan ahead for guests because they have a hard time thinking of things to do. She mentions that Lady Grenfell visited the kitchen but the boys didn't have clean aprons and Mr. Hill didn't have a clean suit. She asks him to make sure that they all have fresh suits and aprons when guests are expected, saying that it would be a good idea to always be ready in an emergency. 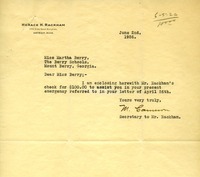 Letter to Martha Berry from M. Cameron, the secretary to Horace H. Rackham, concerning his donation via check to the schools in light of an emergency Miss Berry referred to in her letter to him.